CHICAGO — Hyundai isn't giving up on hatchbacks and believes Americans might be willing to buy more than in the past. That's why the Korean automaker revealed an all-new version of its Elantra hatchback Thursday at the Chicago Auto Show that is lower, wider, and longer than the outgoing version. Hyundai says its new Elantra GT has a more aggressive stance and has added interior volume to its European style. With 55 cubic feet of interior space, Hyundai says the new GT has more space than any other compact hatchback in the market today. 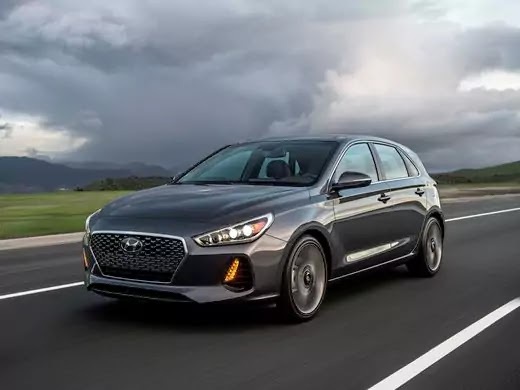 The Hyundai GT competes against hatchback versions of the Chevrolet Cruze, Ford Focus, Honda Civic, Mazda3 and Volkswagen Golf. In Europe, where hatchbacks are referred to as "the boot," five-door vehicles like the Elantra GT are more popular than sedans. In America, they are far less popular. But Hyundai says it expects sales of its new Elantra hatchback will exceed 15% of overall Elantra sales, or about 5% more than its current sales mix of Elantras. The Elantra has been a core part of Hyundai's lineup for years and was the automaker's top-selling car in the U.S. in 2016 even as overall industry sales of cars fell. Hyundai sold more than 208,000 Elantra sedans and hatchbacks in 2016, a 13.8% decline compared with the prior year. The 2018 Elantra hatchback will be offered in two versions -- the GT and the GT Sport -- when it goes on sale this summer. The Elantra GT will be powered by a 2-liter, 4-cylinder engine that produces 162 horsepower. The GT Sport will be powered by a 1.6-liter turbo engine with 201 horsepower.